Whenever I make a lot of ice cream, I will get into problem, >*<. Not a big one but it's annoying for me, the problem is I have too many egg whites -*-. I try to make macaron or butter cream but it's still there, so I have to find other way to use it. 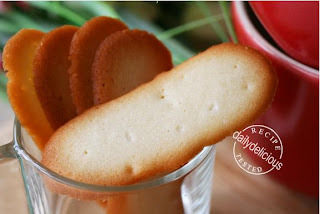 Then I remember, there are some of the cookies that use egg whites for their crisp character, like tulie or langues de chat. I make the tulies many time so this time let make something new (haha, for my blog). 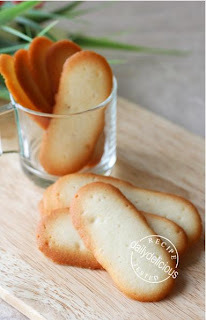 Langues de chat is easier to make than the tulies, just pipe the mixture and it will spread into thin cookies in the oven. So, let's change the problem into something delicious. It'll be a good way to get rid of the egg whites in your fridge too. Preheat the oven to 170°C. Line the baking sheet with baking paper. Melt the butter by putting the butter in a bowl and place over the pan of simmering water, then take the bowl out of the pan. 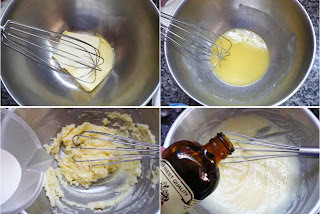 Pour the icing sugar and salt in the butter whisk to combine. Pour the cream into the butter bowl and mix, then whisk in the vanilla essence. Pour the egg whites into the butter mixture, whisk to combine. Put the flour into the butter mixture, fold to combine. Put the mixture into the piping bag fitted with 1.5cm nozzle. Pipe into 6cm long cookie. Bake the cookies for 10-15 minutes, or until golden brown around the edge. 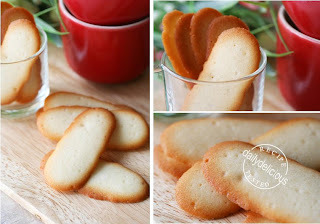 I would like to know whether your recipe for Langues de chat (cat's tongues cookies)is suitable for making charlottes cake? 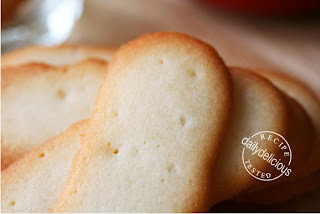 If not do you have any recipe for homemade Lady Finger? 60 gm egg whites equilivant to how many eggs? I want to use meringue powder to subsitute is it oki? 60g is about 2 egg whites, and I think you can use meringue powder instead of the fresh one. Thanks for sharing this recipe (with whipping cream). I try it today, my children love it so much. Puffy Twist Donut: Easy treats for everyone!